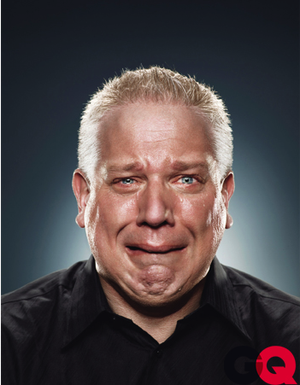 One ticket for the live Glenn Beck movie,” I said. “Twenty dollars,” the girl behind the glass replied. “One ticket,” I repeated, thinking the girl must have misheard me. “Twenty dollars is how much one ticket costs,” she said. I frowned, gave her my credit card, walked into the Regal Village Square multiplex, found theater No. 9 and took a seat next to a married couple named Chris and Christina. They told me that they watch The Glenn Beck Program, that they read Beck’s book Common Sense and that they “went through parts of” Beck’s latest book, Arguing with Idiots. “Did you guys know tickets were going to be 20 bucks?” I asked. Chris said he didn’t, and then he frowned, too. I met a second married couple, Art and Debbie, who told me that they also watch Beck’s show. Every single day. Fifteen minutes before showtime, with the theater lights still on, Beck appeared on screen and welcomed everybody to the show via pre-taped message. He was sitting before a bookshelf filled with books, and every last one of ’em was The Christmas Sweater, by Glenn Beck. Cut to a shot of a theater stage on which a choir of children sang Christmas songs. Maybe two of the 20 kids were white. Contrast that with the people at Regal Village Square; everybody sitting in the theater was white. (You can read the rest of the story by clicking HERE or at LASVEGASWEEKLY.COM).